I’ve successfully completed the first semester of Chinese Studies at university and am quickly approaching 250 hours of Mandarin listening and understanding, which has allowed me to start listening to ChinesePOD Upper Intermediate Lessons and understand 75% or more of relatively quickly-spoken Mandarin between John and Jenny about the content of the dialogues, and I’ve reached the 4th stage that Khatzumoto talks about (http://www.youtube.com/watch?v=J34i9lr94pI&list=UUTuslvwrGyHUrmjlPDeojKw&index=62&feature=plpp_video#t=4m05) in many contexts of Mandarin listening. Taking a mandatory intensive Mandarin course as part of the study program and teaching an intensive English course at the university’s language center in the last two months has thrown a bit of a wrench into the blogging process, but I’m excited to share a great tool I’ve discovered which I hope will aid you in your acquisition of Mandarin. A lot of people are on the fence about the effectiveness of using a Spaced Repetition System (SRS) for language learning, but I’ve found that, as long as it’s used in moderation (no more than 30 minutes a day maximum for creating and studying cards, depending on time and desire), it’s a great way not only to ensure you remember the content of what you learn, but to accelerate the speed at which words and phrases move from your passive (comprehension) to your active (use) vocabulary. 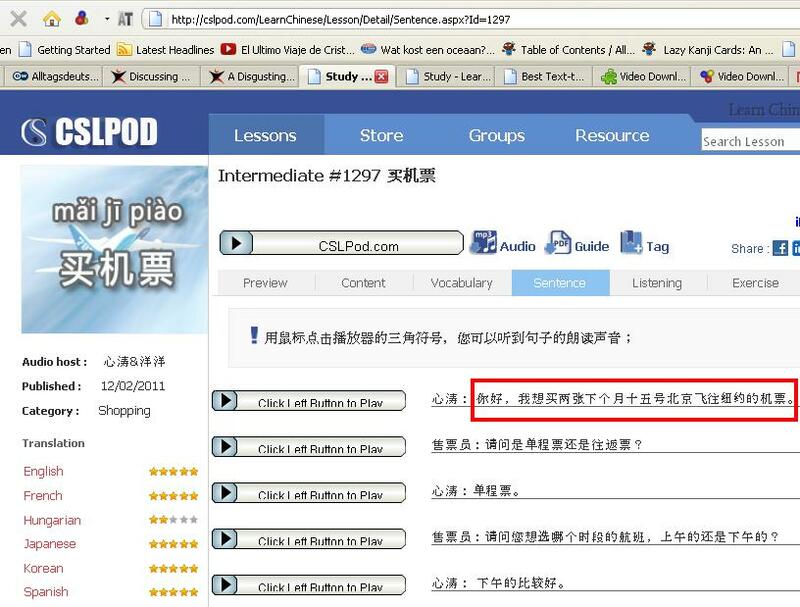 In addition to ChineseLearnOnline, ChinesePOD and CSLPod also offer sentence-by-sentence audio (the great thing about CSLPod is that they’re FREE), but what if you have sentences from your Chinese class, nciku.com, or an article or book you’re reading for which you don’t have any audio and you’d like to add them to your SRS sentence deck? 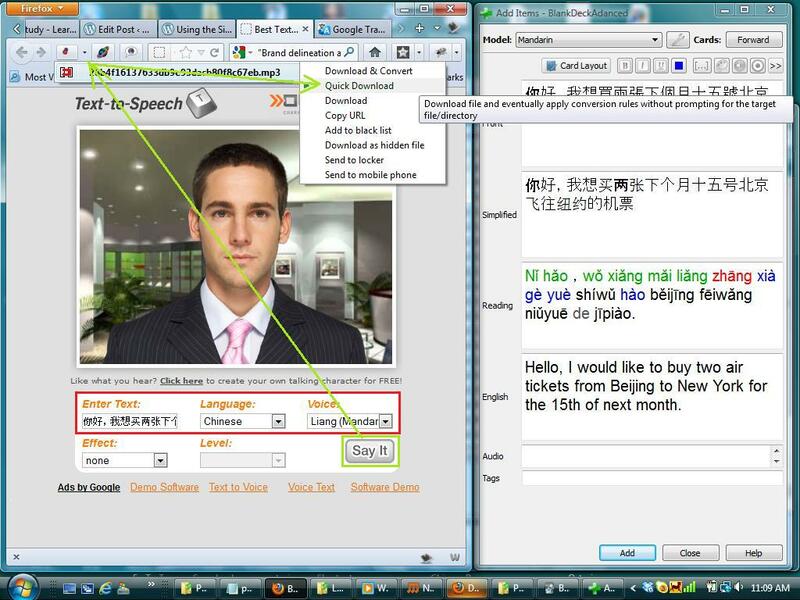 I’ve discovered that you can use the SitePal Text-to-Speech Demo and the Firefox Add-On VideoDownloadHelper to create quite authentic-sounding Text-To-Speech (TTS) MP3s for individual sentences in Mandarin and many other languages. I’ve tested the authenticity of the Mandarin pronunciation and intonation of the sentences by comparing them against sentence audios from the podcasts mentioned above, and although they certainly don’t sound as natural as those created by native speaker humans:), they are really quite good and more than adequate for your purposes if you have a spaced repetition deck with sentence audios. 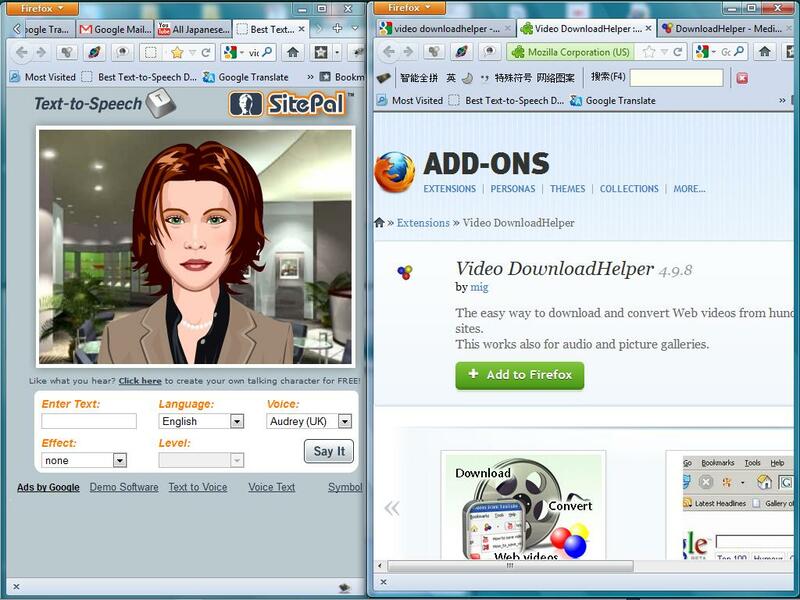 1) Download the Firefox Add-On VideoDownloadHelper and restart Firefox (you will be prompted by the browser) so that it will be usable. The user manual is here and will show you screenshots displaying where the add-on will show up (next to the address bar) and how to use it. 3) Call up the SitePal Text-to-Speech Demo and copy the above sentence from the CSLPod sentence page for that lesson into the box labeled Enter Text. 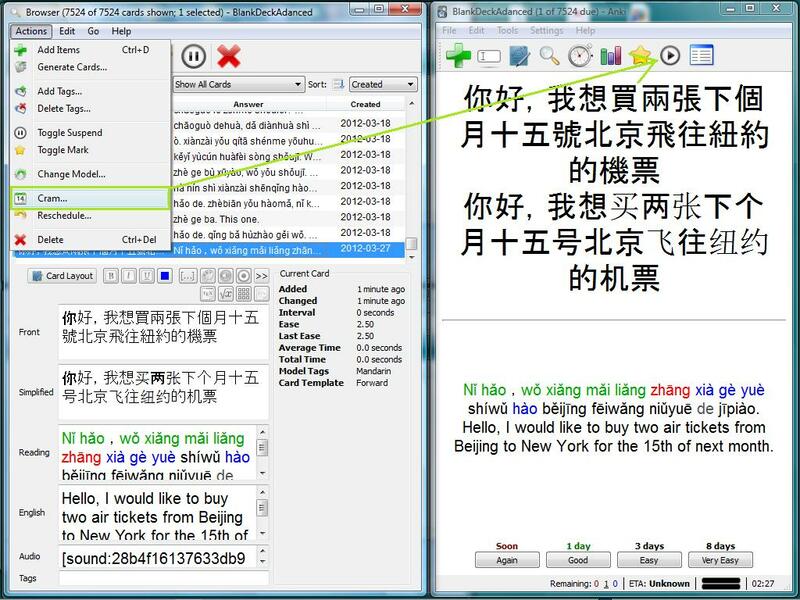 Choose Chinese from the dropdown menu under Language, and then choose which Voice you’d like. I like the male voice Liang, but it’s perfectly up to you which you choose:) Then click on Say It. 4) The VideoDownloadHelper symbol of three colored spheres, which is normally gray, will light up and begin to move next to the address bar.Click on the downward-pointing arrow just to the right of it and you will see the numeric name of the .mp3 file.Scroll over the name and you will see a drop down menu with a number of options.Use Quick Download to download the audio to your hard drive and then upload it from your Downloads folder into the audio slot of the Anki card you created for the sentence (see screen shot below). The audio will automatically be copied and placed into the audio folder for your deck, which in my case is located in my Dropbox folder. 5) If you want to test out the card audio, just open up the deck browser, scroll to the end of your deck, select the new card, and then go to Actions->Cram.The card testing interface will open (shown on the right in the screen shot) and should play your audio immediately, or you can repeat the audio by using the button just above the card on the right of the quick action bar. And here you can listen to the original and the TTS version to make a comparison for yourself! As I mentioned above, I’ve set up my Anki so that the audio for my decks is automatically placed into my Dropbox folder so that I can access my audio decks through AnkiWeb anytime, anywhere. If you want to have audio for your personal decks on your Android phone with AnkiDroid (click to see an introductory video – I’m not a Mac user, but you should be able find the info you need to do this for your iPhone/iPad here), all you have to do is copy the audio folder from your computer into the /mnt/sdcard/AnkiDroid folder on your Android phone, so that it’s “sitting next to” the deck. For example, if I have an audio deck called ChinesePODVocab on my computer, then I will have a corresponding media folder called ChinesePODVocab.media. Copy this folder into the /mnt/sdcard/AnkiDroid folder on your phone, unmount your SD card from the computer, open your Anki deck, and enjoy your audio deck on your phone. I hope this tutorial was useful. Please let me know if anything was unclear, and happy learning! Listening first is the best approach and using this to learn Chinese(or any other foreign language) is definitely the best way. Your stuff is informative and keep up the good work! Personally, I like Ting Ting on “slow”. Liang is a little non-standard. Is there an easy way to just get the sentences straight from CSLPod? For example, just “cut up” the original mp3 file? 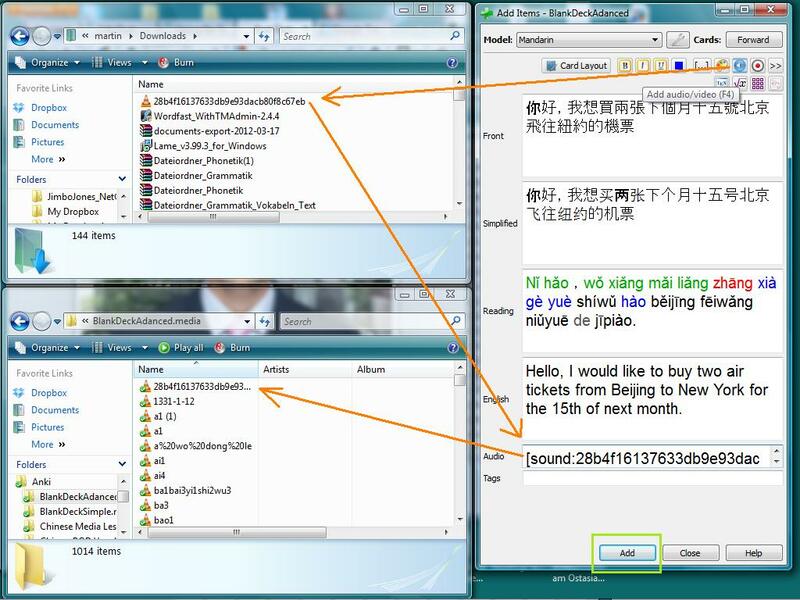 There is probably a good market for a 10,000+ mandarin mp3 sentence files with embedded lyrics.